When I traveled to Ecuador three years ago it was an eye-opening experience. I arrived in Quito at night with no knowledge of the city. It would be a pleasant surprise as the charming city is the world’s first UNESCO Cultural Heritage City. As a solo backpacker on a tight budget I barely scratched the surface, I knew I would have to return one day with Cameron and explore deeper. Now we just wrapped up our first visit together to the historic city. It was a wonderful Andean adventure that we got to sink our teeth into Ecuadorian culture. I liked my time in Quito for the first time around, but I absolutely fell in love with it the second time. 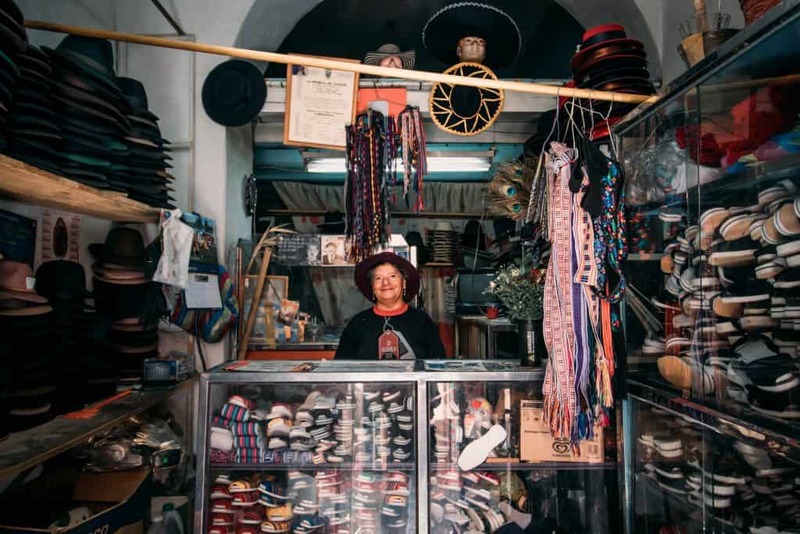 We spent a few days chatting with local artisans, hopping into historic churches, and trying delicious Ecuadorian food. If you’re wondering where to stay in Quito and what to do read on! We went on a private tour with Ramiro, a guide at Metropolitan Touring who organized our entire Ecuador trip. Since my previous time in Quito, I acted as a budget conscious backpacker I skipped out on a number of things including a tour guide. So, I was eager for a local guide gain a deeper understanding of life in Ecuador. Guides are a wonderful way to see things that most tourists do not get to experience. Ramiro picked us up at our hotel bright and early to assist us around Quito. We were met by another local resident, Patricia, who is a member of Quito’s San Roque neighborhood. When I visited Quito before I wandered the streets aimlessly and alone not knowing what I was looking at or not comfortable to walk into the “nontouristy” places to have a conversation. Ramiro’s intent was to help us understand more about the people who live in Quito and its history. For a few hours, we strolled in and out of local artisans, hat makers, and herbal healers stores. All places that we definitely would not have felt completely comfortable as foreigners to walk in alone. Not that locals aren’t friendly. 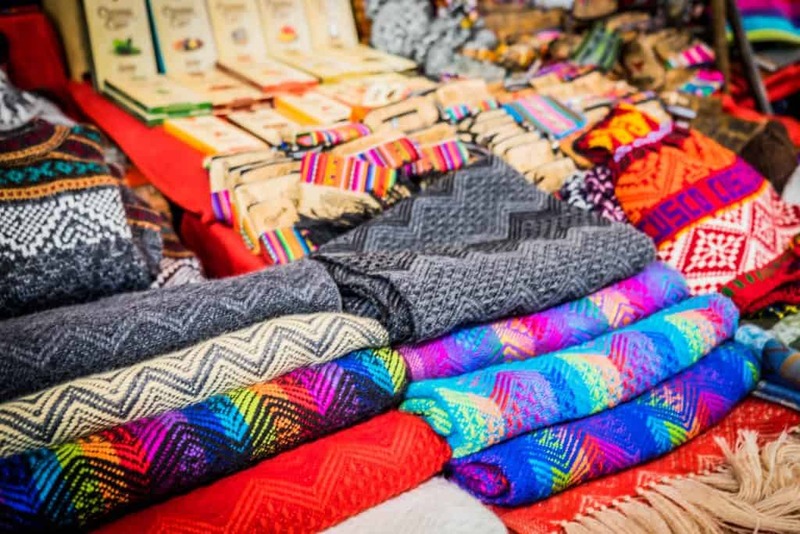 We also wandered into the San Francisco Market one of the oldest in Quito. 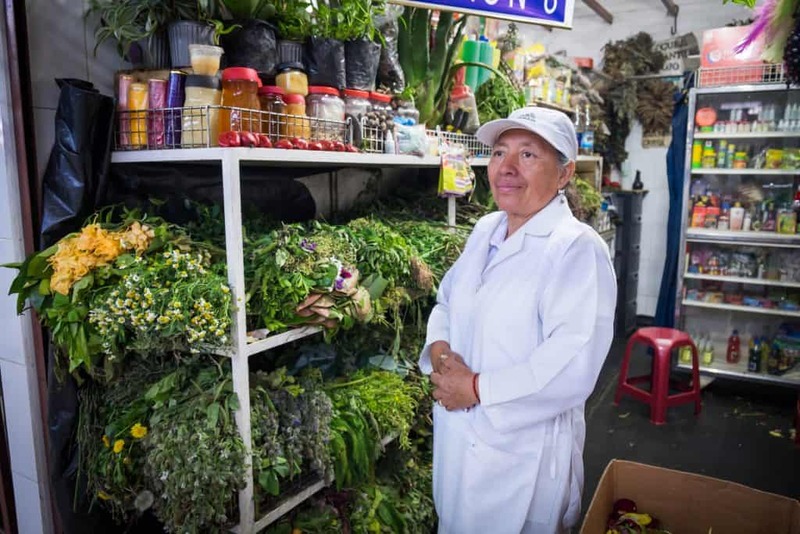 In the market, we tried a few Ecuadorian drinks and learned more about the culinary traditions of the country. This truly was one of the more enlightening ways I’ve learned about a city and culture. I was so thankful to have Ramiro and Patricia to guide me through it, especially since neither Cameron or I speak Spanish. After lunch, we went dove more into the city and checked out the historical, culinary, and architectural parts of Quito. From the city center, you may see a cable car venturing up and down the mountain all day transporting daily commuters to and from home. Well, it’s also possible to ride the cable car 12,000 feet into the sky as a tourist! You’ll have amazing views from the top of Cruz Loma and if it’s a clear day you can even catch a peak of Cotopaxi and other volcanoes. This Skyrail is the highest in South America and one of the highest in the world! Besides offering stellar views it’s also where you’ll jump off to hike the main peaks of the Pichincha volcano, active stratovolcano! Built between 1536 and 1580 this church is one of the largest religious complexes in America. Walking in you’ll notice that it is Baroque style and dazzling in gold with images of the sun god and other Inca tributes. 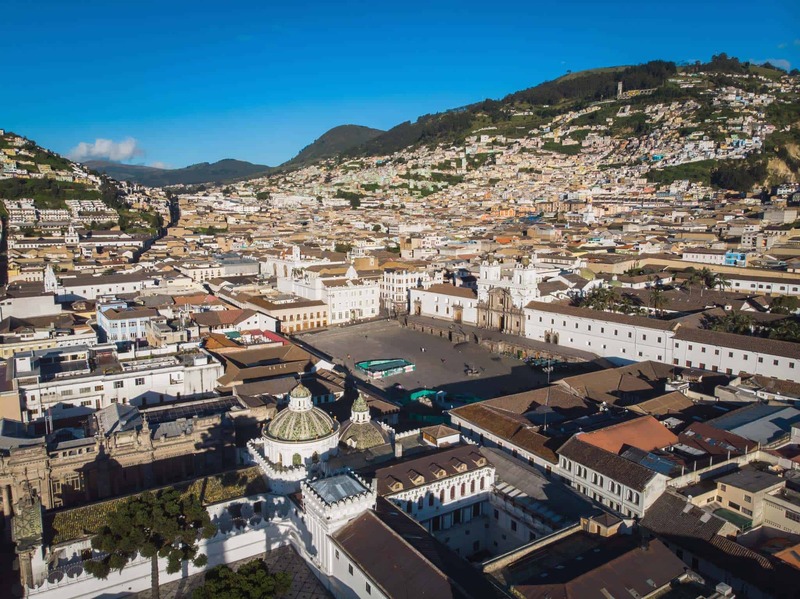 Head upstairs for a great overview of Quito’s Virgin, which is the only winged image of the Virgin Mary. Don’t forget to take a walk around the outside grounds – you may even get lucky and see some of their residential parrots. 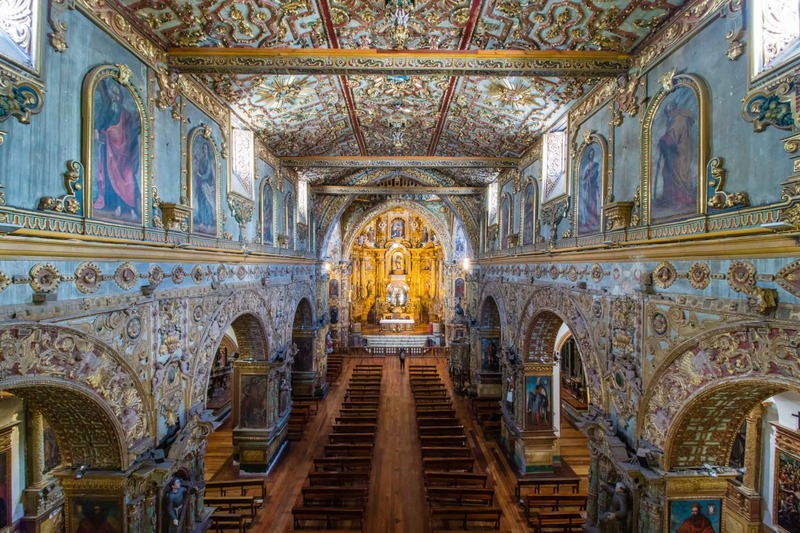 This fantastic museum houses pieces that date back 5,000 years, all beautifully arranged within an old 17th-century mansion near the Plaza del San Francisco. The building itself is impressive enough, but once inside you’ll see the ancient artifacts that are still in amazing condition. This small neighborhood is just two blocks of tiendas (small stores). This area is cute and colorful and you’ll definitely recognize it as La Ronda as soon as you find it. It’s along these streets you’ll find small restaurants, cafes, boutique clothing stores, bakeries, bars, and a few small hotels. 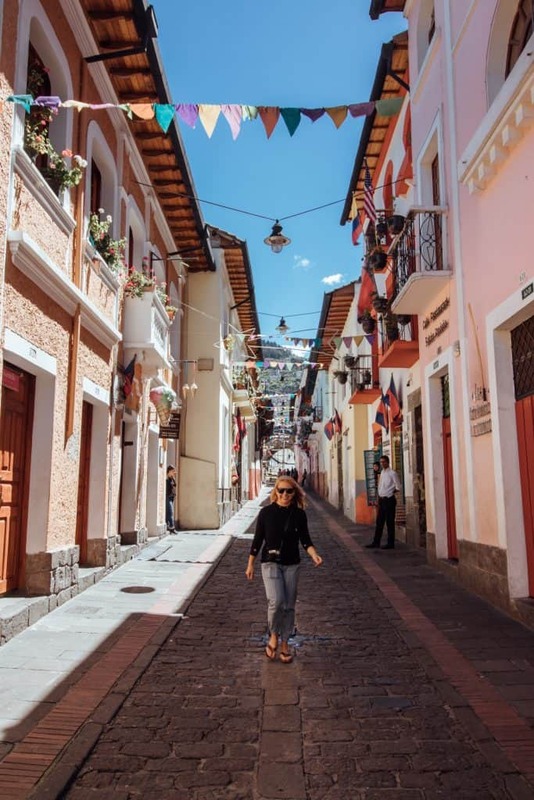 La Ronda is where various cultural activities in Quito take place so make sure to take a walk down it, it’s a good way to get a feeling of Ecuadorian heritage. Ecuador is known to have some of the best cocoa in the world. The country produces over 60% of the world’s “fine aroma” cocoa and has recently turned to not just exporting cocoa but actually making chocolate. I would highly recommend partaking in a chocolate tour at least once while in the country. We visited Chez Tiff on La Ronda street for a detailed explanation and chocolate tasting. If you’re in the mood to shop and haggle you’ll have to head to the Mercado. It’s essentially half a city block filled with more than 200 crafts stalls selling all kinds of souvenirs. Mitad del Mundo is outside the Quito city center and can be reached by a short taxi or bus ride. It’s perhaps the most touristy thing to do in Quito, but people flock here to stand on the equator. By now, you probably know that the monument and yellow “selfie” line here isn’t the actual equator. GPS technology has proven that the actual equator is a few hundred meters north, but there is no mention of that anywhere at Mitad del Mundo. Instead, here you will find a few cafes, a planetarium, and street vendors selling knick-knacks and food. It’s a fun half day out even if it’s not the real thing! If you are looking for the real equator turn left when you walk out of the Mitad del Mundo walk uphill 250 meters. When you see signs for Museum Intinan, turn left and follow the road. It’s there that you will see a red line across the earth and a small marker. Now pat yourself on the back for finding the real equator. 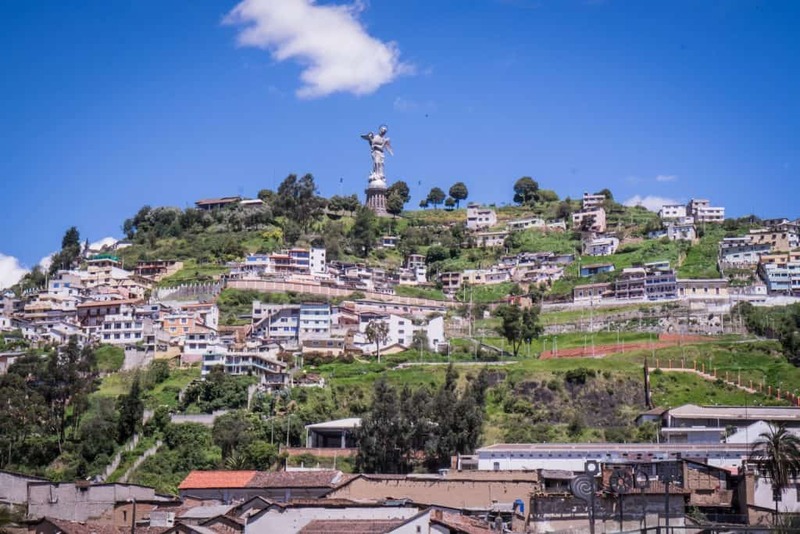 You certainly can’t miss the giant Virgin Mary statue keeping guard over Quito. She stands 45 meters high and is impressive to look see throughout the city. However, the 360 degree views get even better from the hill. The Virgin is best visited in the morning while the sun is still interrupted by the clouds. It’s advised not to hike up here as the road up has been known to be steep and dangerous with visitors getting mugged. A cab ride up should cost no more than a few dollars. If you’re into neo-Gothic architecture you can’t miss the Basilica that towers over the city. 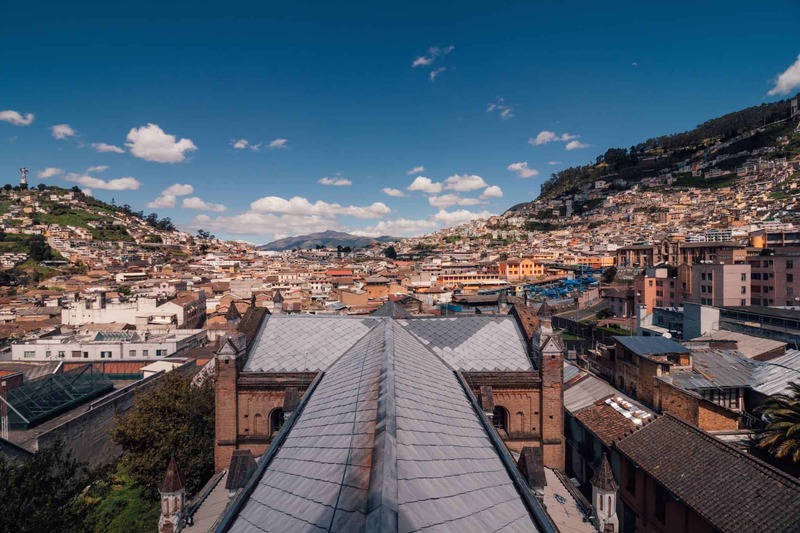 The Basilica can be seen from just about anywhere in Quito and is massive at a hundred and fifty meters long, thirty-five meters tall and thirty-five meters wide. Visitors can visit the Basilica every day to see the impressive architecture. Like the famous Sagrada Del Familia parts of the Basilica are still unfinished, but that doesn’t take away from the grandeur. It’s possible to climb the steep stairs up to the top for impressive views and to marvel at the gargoyles. The access price is $ 1 for Ecuadorians and $2 for foreigners. 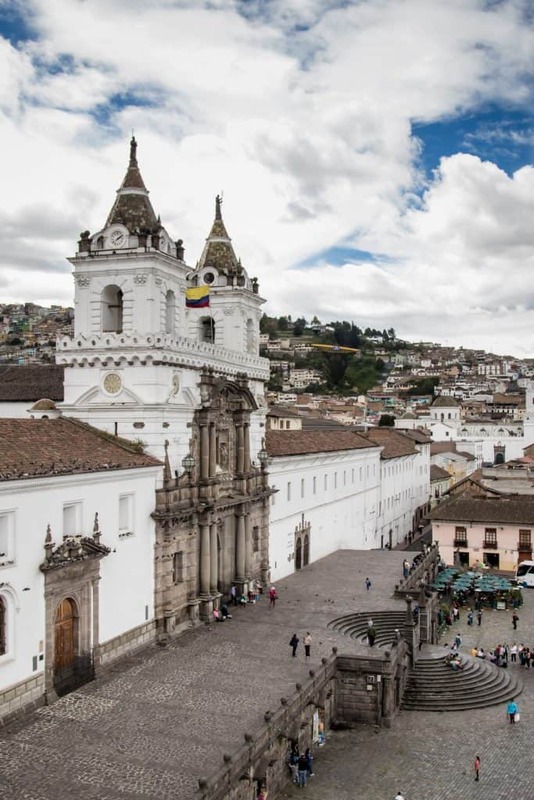 Independent plaza is at the center of Quito’s old town and is almost always buzzing with life. It’s where locals and tourists mix to soak in the atmosphere. At the center stands a monument commemorating Ecuador’s Independence in 1809. All around you’ll find people chatting, playing cards, and watching life pass by. It is in this plaza where you will also see the Presidential Palace and many overpriced souvenir shops. We found many nice places to eat in this area of town and it was always under heavy surveillance by police making it safe at night. In the 18th century, one of the wealthiest families in Ecuador acquired a mansion on the corner of the San Francisco Plaza. After a fire completely destroyed the mansion, it was rebuilt in 1914 by the Gangotena family into a European style palace. During that time it was one of the most stylish and well-regarded residences in the entire city. The style, elegance, and amazing structure still stand today and as of 2012 has been newly restored as a boutique Hotel. 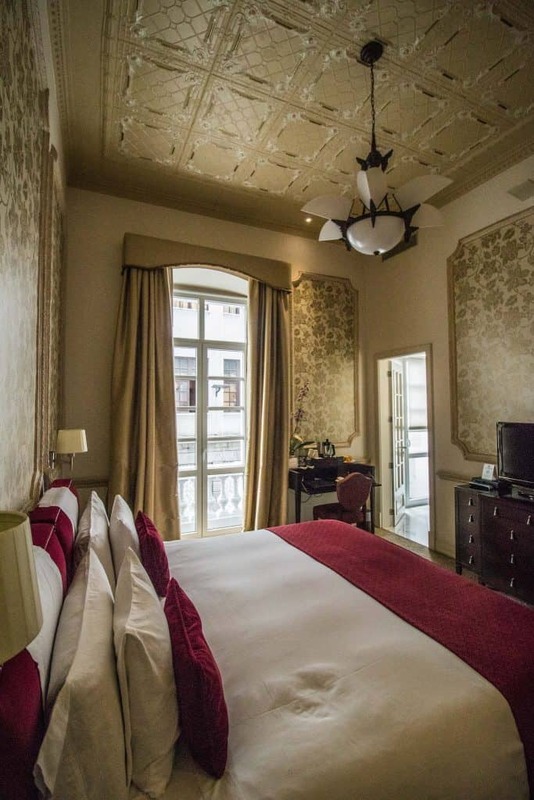 Casa Gangotena is easily the most romantic hotel in all of Quito, maybe even South America. It has the beautiful building sits in a prime location in the old town next to the San Francisco Monastery. 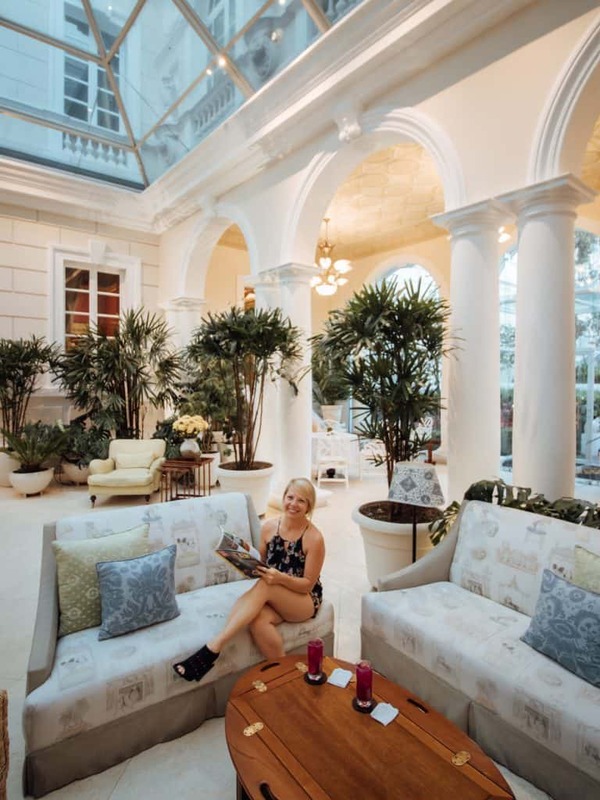 The beautiful hotel features 31 exquisite rooms, an out of this world terrace where you can watch the sun rise and set, and a lovely indoor and outdoor courtyard of the ground floor to enjoy afternoon tea or a drink. 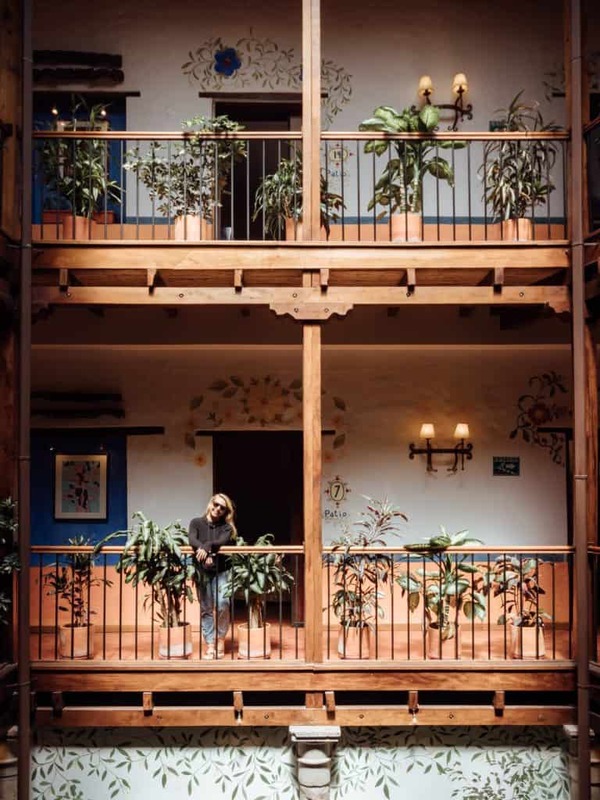 Our experience at Casa Gangotena was exquisite, and it is easily one of our favorite city properties in the world. 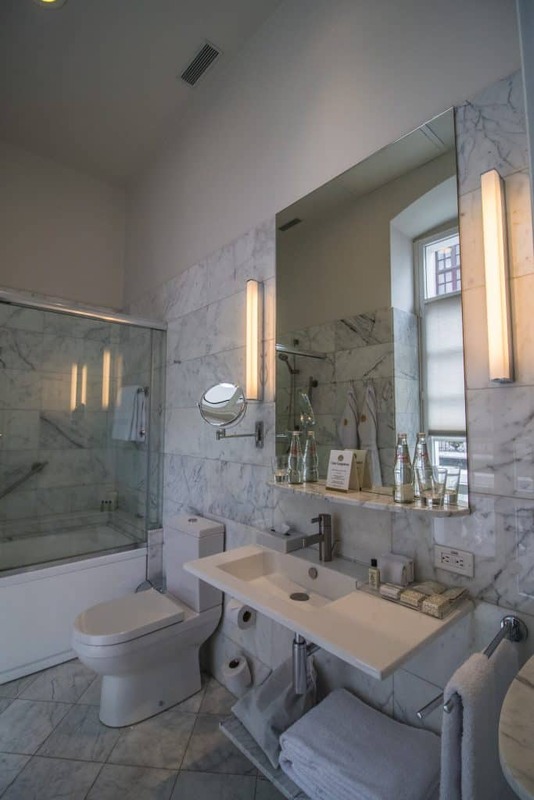 The property has been lovingly resorted and feels as if you’ve stepped back in time. The staff go above and beyond to make sure you are enjoying your stay. They’re quick to remember your face and refer to you by name a touch that does not go unnoticed. Even when calling a cab they will only do so with reliable cab drivers and ensure that you are not ripped off (which can easily happen in Quito). 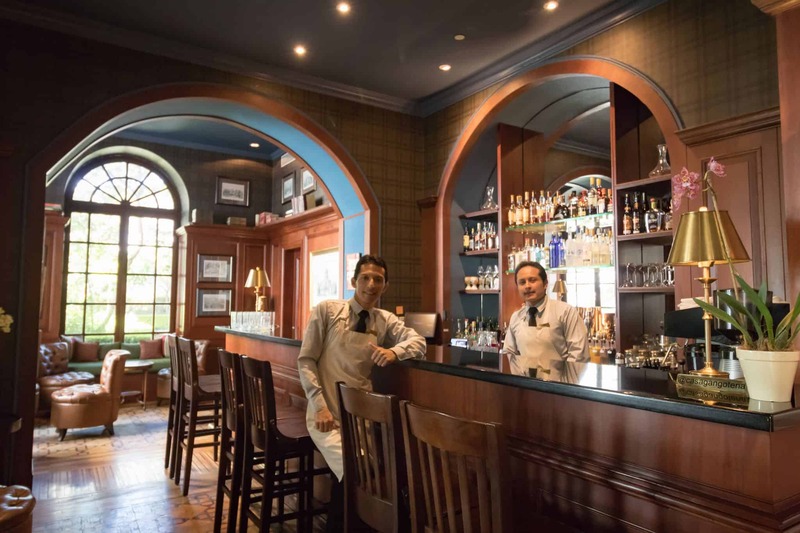 Casa Gangotena also has a full-service restaurant, bar, and 24/7 room service. The lovely dining room is light and airy in the morning as they serve a healthy and delicious breakfast, the perfect way to start the day. With our busy scehdule, we had two mornings where we left too early for breakfast (5 am) and the staff happily packed us a beautiful spread with coffee. For lunch and dinner service, the restaurant transforms into a fine dining environment serving up international and Ecuadorian cuisine. It’s also possible to join in on high tea in the dining area. We did not have time to try this experience but were told by more than a few that it was well worth it. We were surprised by the beauty of the rooms at Casa Gangotena. 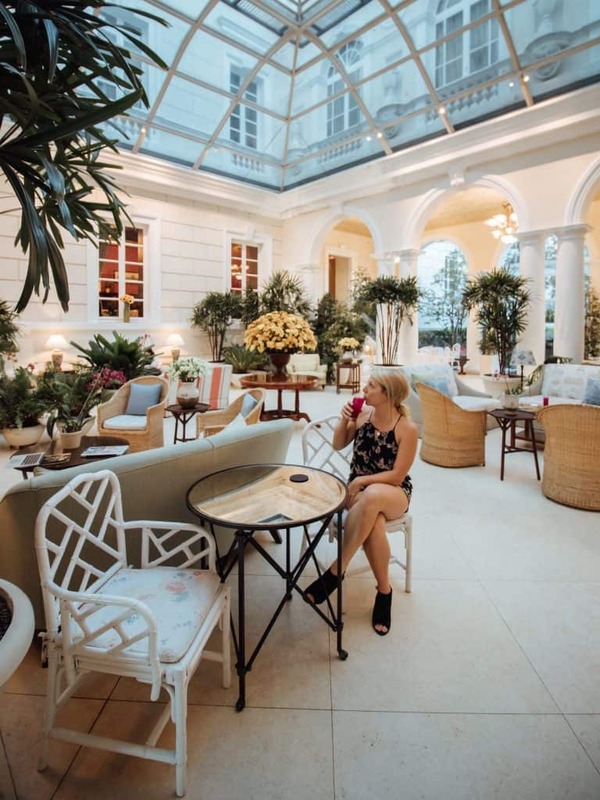 Many have a private terrace, large modern bathrooms, comfortable beds, satellite television, daily fresh fruits, and ground South American coffee beans waiting for you. Seriously, it was hard for us to leave the room! 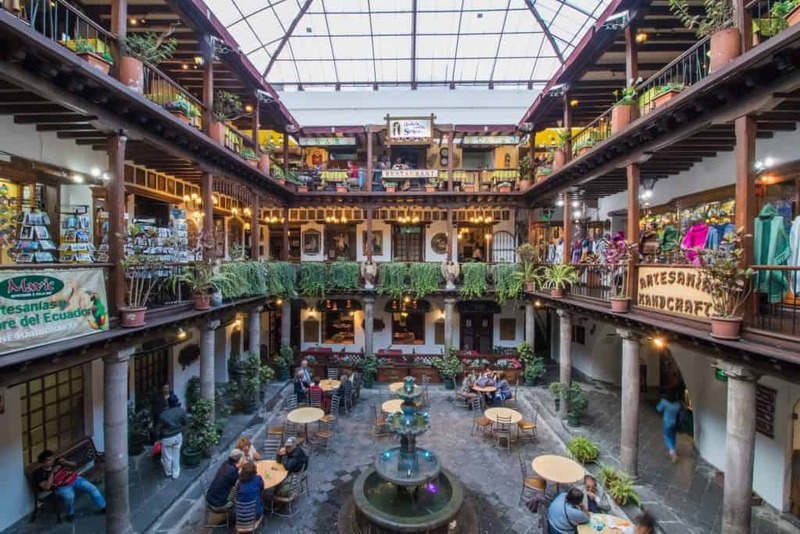 Perhaps the best part about Casa Gangotena is the location, which is unbeatable for exploring Quito’s historic heart. 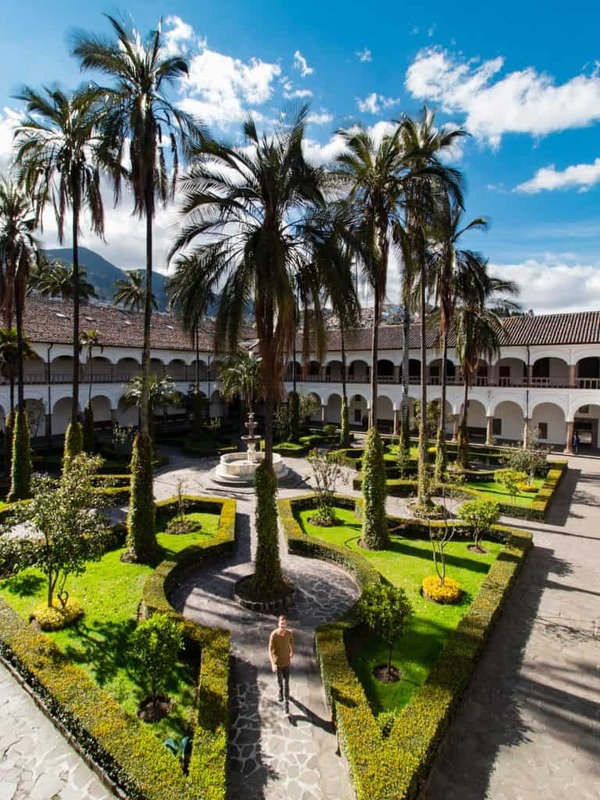 Just one step out of the doors and you are in the center of the Andes with South America’s most scenic old town full of restaurants, Baroque churches, local artisans, and numerous markets. The main airport, Mariscal Sucre International, is about 45 minutes outside of Quito city center. Taxi rides should cost $20-$25 to and from the airport. Make sure to agree to a price beforehand or make sure the meter is running. Quito taxi drivers are known for being shady. 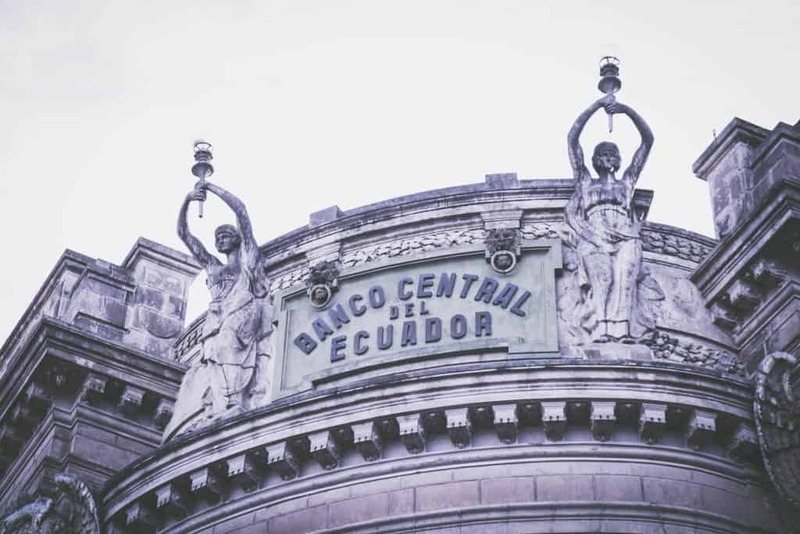 The value or the sucre took a nosedive in 2000, and ever since Ecuador has been operating with the US dollar as their main currency. If you go to the ATM to pull out cash don’t be surprised to see USD coming out of the dispenser. Read more of our travel banking tips here. 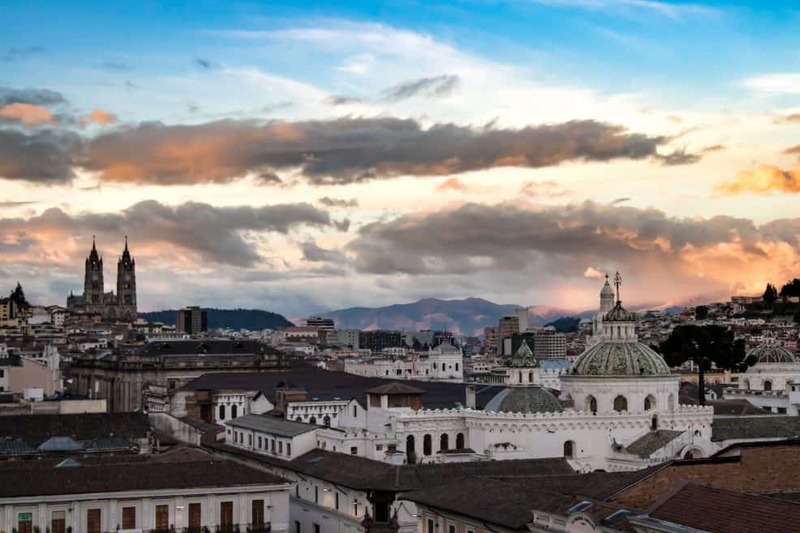 Quito is one of the highest cities in the world. If you’re prone to altitude sickness take precautionary measures. Although, both times I’ve been to Quito I have had absolutely no problems. The tap water in Ecuador is not drinkable. If you’re staying at a higher end hotel they will likely have filtered water always available for you to refill your bottles. If not consider getting a big jug of water and refilling your bottles from that. Try not to waste plastic bottles. Be wary of scams and pickpockets in the capital. Don’t flash expensive electronics and always be mindful of your possessions. Don’t forget a jacket! While spring weather is common in Quito during the day it can get very cold at night. It won’t hurt to brush up on your Spanish before traveling to Ecuador. 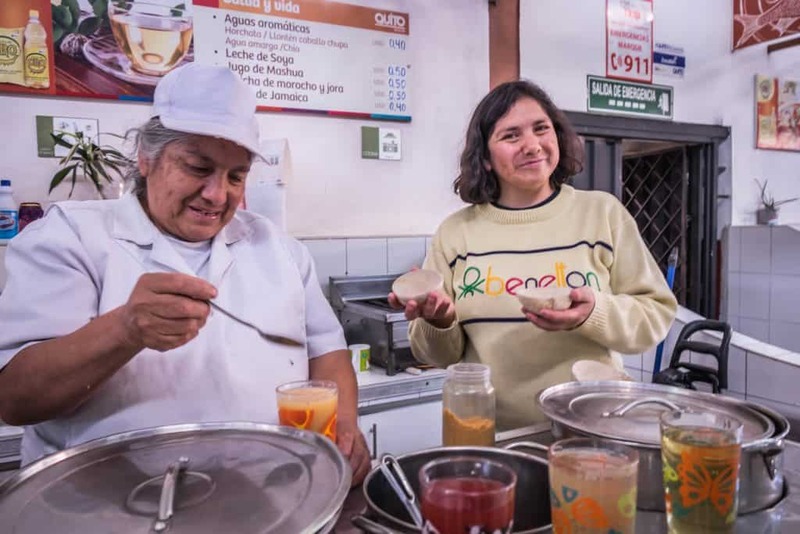 While Ecuadorians who work in tourism can usually speak English you may be hard pressed to find it widely spoken elsewhere. Quito is a moderately conservative city. You’ll find churches on just about every corner. Make sure to dress appropriately for the country you are in. Tipping 10% is common in restaurants in Quito. If you’re heading to the Galapagos make sure to read all of our tips and info! We never travel without travel insurance with World Nomads. I would recommend getting World Nomads for your trip to Ecuador, they offer flexible plans for all!